I hosted this month's Food'N'Flix and I chose The Lunchbox*. You can read my invitation: here. Unlike most of the films I've selected for the group, I had never actually watched this movie. But I'm so glad I did! The group shared recipes for everything from a mango cocktail to curries and, even, the paratha that serve as the "envelopes" for the correspondence between Ila and Saajan. I am sharing The Lunchbox-inspired dishes in order that I received them from the bloggers. What a delicious looking Smörgåsbord of Indian food! I can't wait to try these dishes. Kimberly of Coffee and Casseroles made Mistaken Identity Wings. 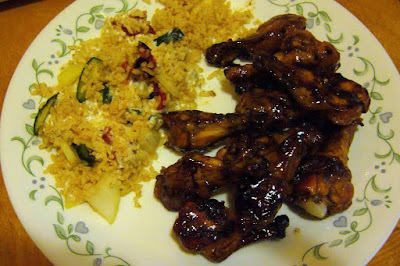 I love that, even though she has been a vegetarian since 2001, she whipped up these wings in a honey garlic sauce for her mom. 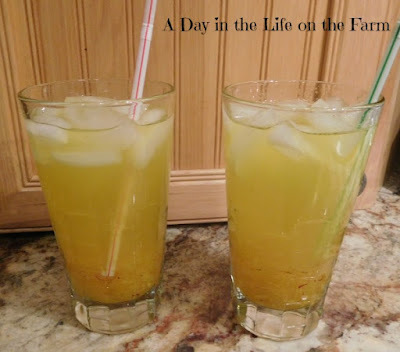 Wendy of A Day in the Life on the Farm poured a Mango Cooler made with a mango paste that she says resembles marmalade in texture and would be fantastic smeared on toast. I think I'll go with her tropical drink with a punch. Heather at All Roads Lead to the Kitchen created Creamy Tomato Shrimp Curry with Turmeric Rice. 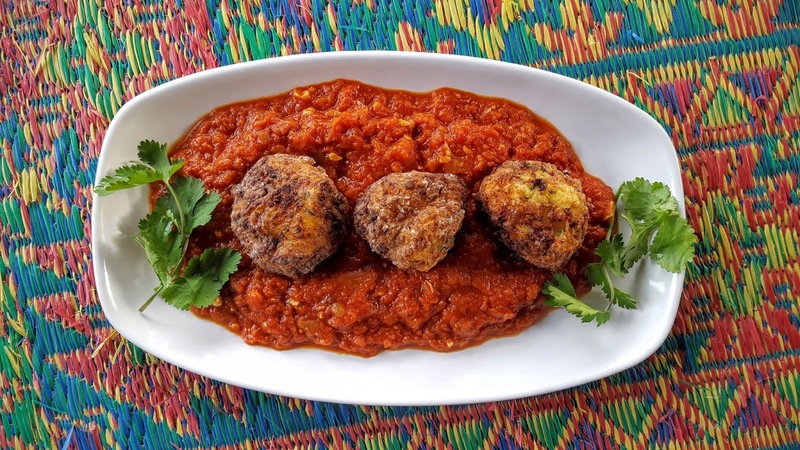 About her selected dish, Heather shares, "With all of its beautiful spices and simple ingredients, I can see Ila making this...and Sajaan eating it." 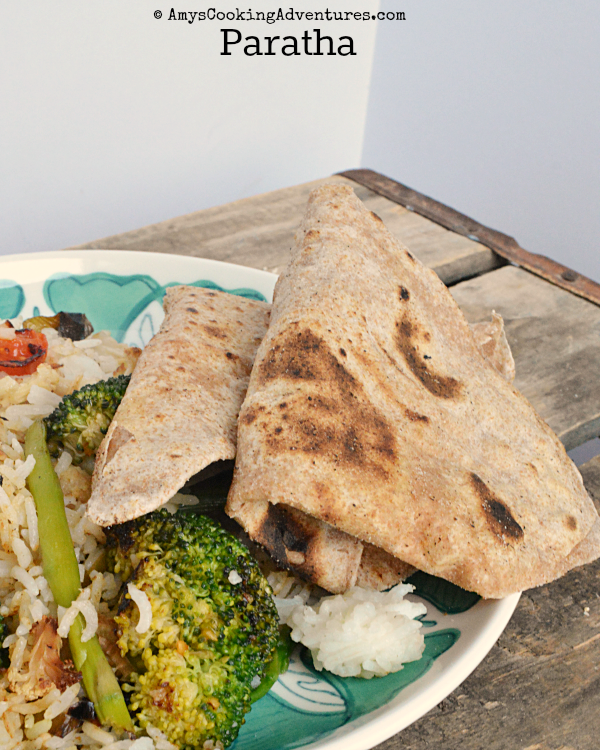 Amy from Amy's Cooking Adventures shared her recipe for Paratha. As I mentioned, these are the "envelopes" into which Ila and Saajan tuck their lunchbox notes. Paratha is a flatbread, very similar to the chapatti she's made before. She writes, comparing the two, "Paratha incorporates a bit more oil and there is a slightly different method for rolling that give paratha its triangular shape (you’ll have to trust me on that – I managed to not get a photo of the unfolded paratha)." Evelyne from CulturEatz shared her recipe for Kadhi Chawal. This was a totally new Indian dish to her...and it's new to me as well. 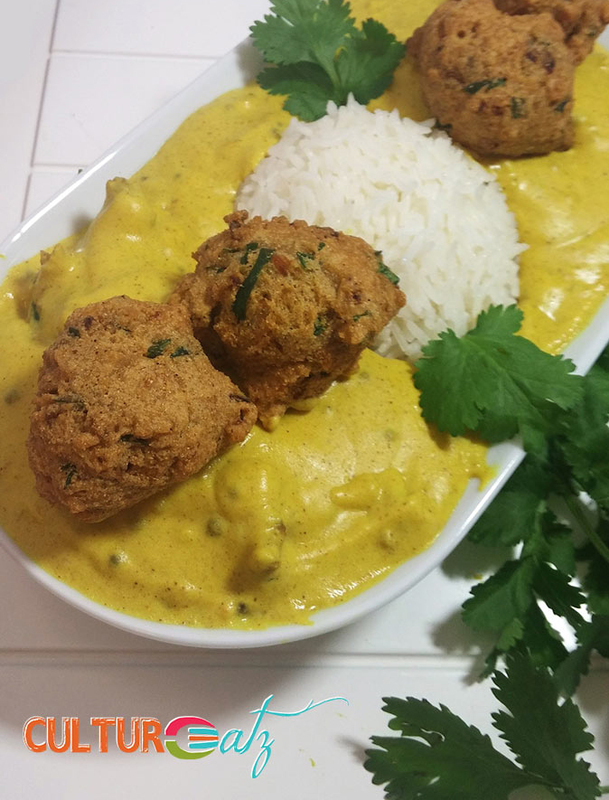 Kadhi Chawal is a spiced yogurt based curry served with rice and chickpea flour fritters. Evelyne muses, "I wonder how many Kadhi Chawal will be delivered tomorrow?" Debra of Eliot's Eats cooked up some Paneer Kofta, deciding to tackle it because this was the dish that Ila sent with her first note to her then unknown lunch recipient. Ila added this was her husband’s favorite meal. That sauce looks amazing! 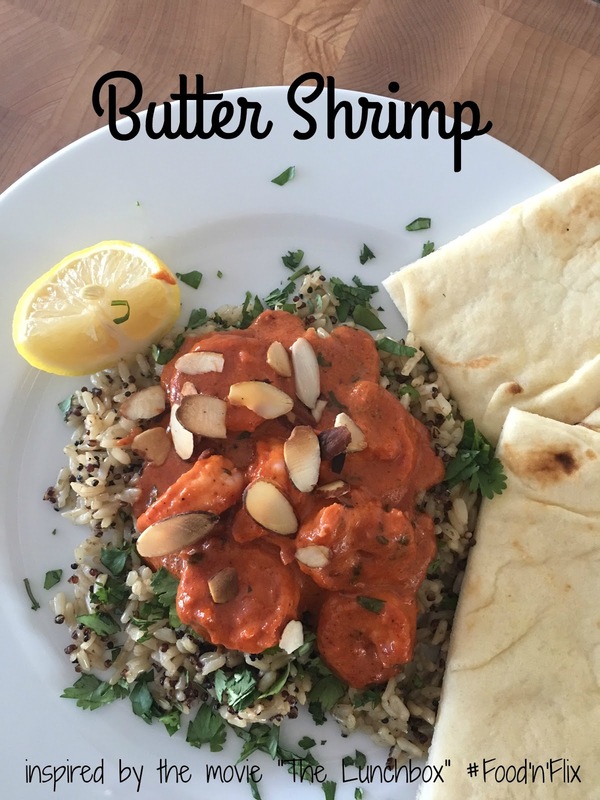 Terri of Our Good Life created her own triple-level tiffin and shared her Indian Butter Shrimp. Terri writes that her first container was the bread. "I heated one naan that I purchased at the Indian grocery store and folded it in fourths, like they do in the movie." 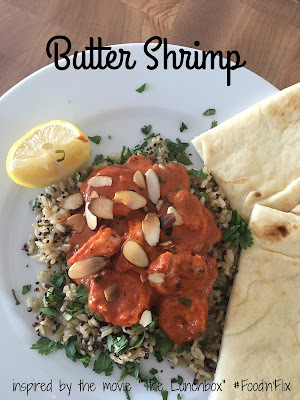 The second container was Indian Butter Shrimp. The third container was rice. Sounds like a great lunch. 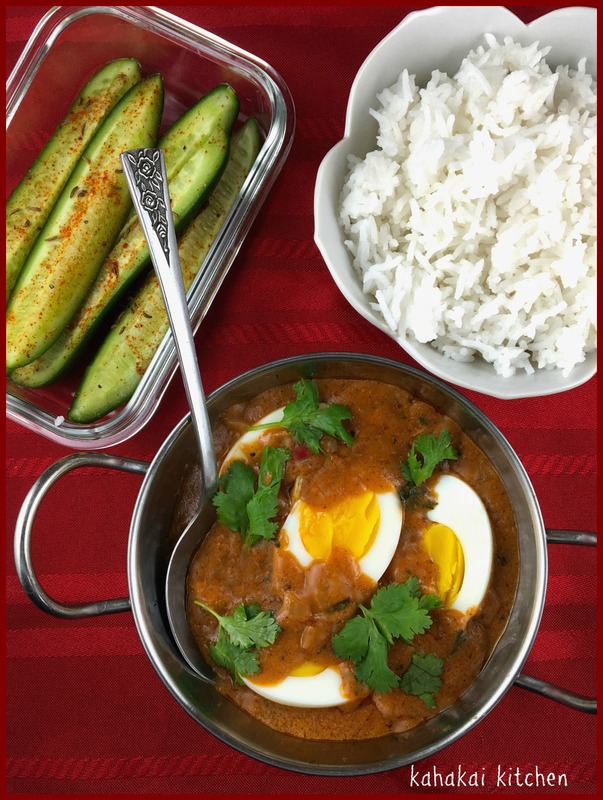 Deb of Kahakai Kitchen presented us with Hard Boiled Eggs in Rich Moghlai Sauce. Deb admits, "I can eat all varieties of curry at all times of the day. but there is just something about a curry with hard boiled eggs that seems perfect for lunch." She got her recipe from Madhur Jaffrey, who offers multiple recipes for egg curries in her cookbooks. She is certainly a curry-master. 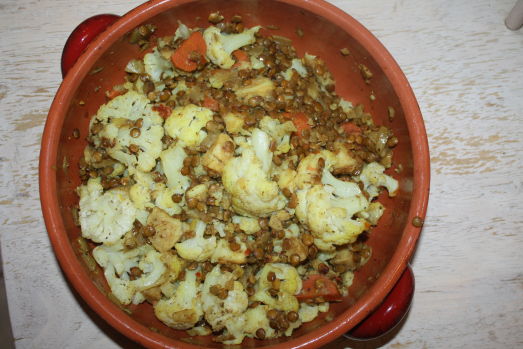 Elizabeth of The Lawyer's Cookbook made Lentil Cauliflower Curry. Because she has given up meat for Lent, this movie came at a good time, inspiring her with the many vegetarian Indian dishes. And she picked a cauliflower dish because that's how Ila learns that her husband has no idea that he isn’t getting the food she was making for him: he comments on her cauliflower and she did not make him cauliflower. And I made Kheema Aloo which Ila tells Saajan is her favorite. Well, Kheema Pao is her favorite. But I couldn't find a recipe for that and went with the Kheema Aloo. 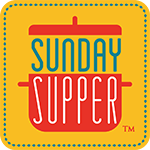 I hope the Food'N'Flixers have inspired you to enjoy The Lunchbox, make some Indian food, or both! Wendy of A Day in the Life on the Farm picked our March selection. We'll be watching, or re-watching, A Walk in the Clouds. * I love that movie. I can't wait to re-watch it with my foodies glasses on and a pencil in hand. The Secret Recipe Club has a fun, themed - fifth Monday - event that blurs the lines between the groups. You can be assigned to any other participating blogger in groups A through D. Our theme this month: Leprechaun & Bunnies. We've been tasked to focus on foods for St. Patrick's Day (corned beef hash, anything green, etc.) and Easter (carrot cake, spring dishes, etc.) since March has both holidays this year! I was assigned to Making Miracles, a blog written by Rebekah. Now, even though we've never met in real life, I feel as if Rebekah and I are good friends. We've been in the same cooking circles for awhile and she has taken part in every multi-blogger event I've coordinated in the past two years. So, I was excited to be assigned to dig deeper into her creations. Initially I leaned towards the "bunnies" part of this assignment, considering our St. Patrick's Day dinner is remarkably the same every year. Corned Beef. Cabbage. And Irish Car Bomb Cupcakes. So, I considered her Oven Roasted Leg of Lamb. Who doesn't love lamb on Easter, right? I chuckled aloud when I thought about making her Rabbit with Mustard Sauce. Okay, rabbit on Easter?!? I only made that mistake once! Her Surprise Inside Carrot Bundt Cake is definitely on my short list of sweets to bake. Recently I learned that there are three categories of potatoes: waxy, starchy, and all-purpose. Starchy, namely russet potatoes, are perfect for gnocchi. Waxy potatoes, such as fingerlings and baby red potatoes, are the ones to use for potato salad. And all-purpose potatoes, such as Yukon gold, red potatoes, and white potatoes, are the ones to use for scalloped potatoes and any dishes where you want the potatoes to hold their shape. Boil the potato slices in salted water until tender, approximately 10 minutes. Drain and cool. Meanwhile, cook bacon however you prefer; I cook mine in the oven. Preheat the oven to 350°F. Butter or grease baking dish. Rough chop the bacon, and reserve 1/4 C (for topping). Whisk the flour, milk, and cream together in large mixing bowl until blended. Stir in the sour cream. Add potatoes, remaining bacon and 2 T herbs; stir gently to evenly coat potatoes. Spoon mixture into prepared baking dish and sprinkle the top evenly with the shredded cheese. Bake in the oven for 30 to 35 minutes. It should be until heated through and cheese melted. Sprinkle with remaining herbs and reserved bacon. Earlier this month, I reviewed Culinary Tea. It's been inspiring me ever since. 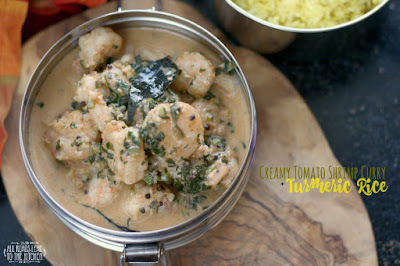 For a quick dinner this week, I adapted the Tung Ting Shrimp recipe since I didn't have any Tung Ting tea or spinach. My green tea and baby arugula version was tasty and simple. I will definitely be making this again soon. Place 1 T tea leaves in a bowl. Heat water to steaming (just before it boils) and pour 1 C water over the tea leaves and let steep for 3 to 5 minutes. Strain out the leaves and reserve the tea. Place remaining 4 T tea leaves in a large bowl with the salt. Add the remaining steamed water and stir until salt is dissolved. Add the shrimp and let stand until just opaque, approximately 3 to 5 minutes, depending on the size of the shrimp. Drain the shrimp and rinse off most of the leaves. I left some in there and it was tasty! In a small mixing bowl, whisk together the reserved tea, rice wine, gin, rice vinegar, garlic, ginger, lemongrass, sesame oil, and fish sauce to make a dressing. To serve place 1 C baby arugula on a plate or in a bowl. Top with shrimp. Drizzle with dressing and sprinkle with black sesame seeds for garnish. As another entree for the blueberry baby shower last weekend, I made Blueberry Chutney-Glazed Chicken Thighs. So easy. Place chicken thighs in a lidded container where they can lay flat in a single layer. Add the remaining ingredients and rub the spices into the meat. Drizzle with olive oil and red wine. Cover the container. Refrigerate overnight. Remove chicken from the refrigerator at least 30 minutes before you want to start cooking. Preheat the oven to 400 degrees F. Place chicken in a baking dish. Drizzle with more olive oil. Roast in the pre-heated oven for 40 minutes, or until chicken is browned and crisp and cooked through. Spoon blueberry chutney on top of each piece of chicken and return to the oven for another 5 to 10 minutes. Serve hot with the remaining blueberry chutney on the side. I wasn't sure I would share this for the Foodie Reads 2016 Challenge, but when my (little) foodies read this book, cuddled on the couch, giggling to themselves multiple times, I changed my mind. They are both in middle school; they read novels and textbooks. But they read this board book until I took it away to wrap it as a baby shower gift. We all have smaller foodies in our lives, right? Maybe they are our kids, our grandkids, our nieces, nephews, or just good friends. And we all have opinions about our food. 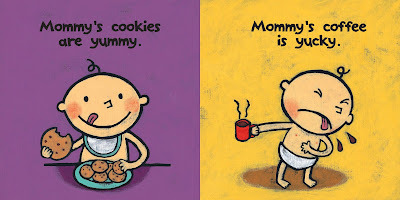 Yummy Yucky by Leslie Patricelli* illustrates the differences between those two adjectives in a charming way. "Spaghetti is yummy. Worms are yucky." "Blueberries are yummy. Blue crayons are yucky." I remember a time in my life when I didn't read anything other than board books. I didn't have the energy to read for myself. But I read to the boys constantly. I'm glad those days are done and that they read constantly on their own. 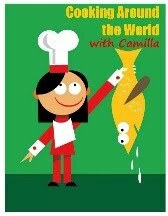 But I thoroughly enjoyed this kids' book by Patricelli. And, I figured, I would share it. It is a book about food after all! Yummy and yucky food. Here's what everyone else is reading this month: February 2016 Foodie Reads Challenge. Inspired by the Quinoa & White Bean Salad I made with my Sun Basket ingredients earlier this month for #FreshTastyValentines, I decided to create a version for my friend's blueberry-themed baby shower. This salad teems with flavor and different textures. Another bonus, it was a great vegan entree for our one vegan friend in attendance. Cook till lightened and fluffy. I typically cook my quinoa in chicken stock, but for this vegan dish, I cooked it in water...the dish has plenty of other flavors. Let cool. In a splash of olive oil, cook the leeks until softened and beginning to turn translucent. Season with paprika, sumac, salt, and pepper. Fold in the beans and stir to coat. In a medium mixing bowl, stir together the seasoned beans, dried blueberries, and fresh cilantro. Let cool. Place all of the ingredients, except the salt and pepper, into a lidded mason jar. Shake to emulsify. Season to taste with salt and pepper. In a large salad bowl, toss your arugula with the lemon vinaigrette. Spoon the cooled quinoa on top fo the arugula. Spoon the seasoned navy beans on top of the quinoa. Sprinkle with fresh blueberries and lemon zest. I am hosting this month's Food'N'Flix and I picked The Lunchbox*. You can read my invitation: here. Unlike most of the films I've selected for the group, I had never actually watched this movie. But I read about it; and the premise seemed interesting. Every day in Mumbai, dabba wallahs pick-up (from home kitchens) and hand deliver (mainly to offices) a quarter of a million hot meals all across the city. It's an intricate network that requires Swiss precision timing and numerous handoffs from dabba wallah to dabba wallah. As the title suggests, the movie revolves around a lunchbox, specifically a glitch in the lunchbox system. Despite what the dabba wallah insists when Ila confronts him with the error; he insists that they never make mistakes, citing that even Harvard studied their system. Regardless there has been an error and the lunches that Ila, a neglected housewife, is making and packing for her husband are being mistakenly delivered to Saajan Fernandes, a curmudgeonly widower on the verge of retiring. And so it begins. Ila and Saajan embark on an epistolary friendship, exchanging notes through the lunchbox by tucking handwritten letters between paratha. This has been billed as a romantic comedy though, to me, it's much more than that. And I’ll leave you to discover what happens to Ila, Sanjeen, and the people in their lives on your own. If you haven't seen it, you should watch The Lunchbox. It's a tale told with respect, restraint, and intelligence. First, a funny note about these stainless steel tiffin boxes. I lean towards 'tree-hugging hippie.' I can't help it; I went to Berkeley! So, when the boys were in 2nd grade and kindergarten, I decided that I wanted to get them tiffin boxes as their lunchboxes. It seemed like a great idea - no plastic, no waste. However, I also had a third box for Jake. The first problem: the lids were not interchangeable. Well, you could switch them, but then you encountered issues with them being too tight or too loose. That led to the second problem: when I accidentally mismatched the bodies and lids - on the side of too tight - the boys couldn't open the boxes on their own. And with three grades in the lunchroom at the same time, they couldn't always flag down adult assistance to open their tiffins. So, our tiffins went the way of the dodo, at least for lunches. Good intentions...but totally not practical. So, now our tiffins store beads and other knick knacks. I did find one shoved to the back of a cabinet in my kitchen! Now, here's how I landed on this dish. Ila and Saajan have never met in person. She suggests that they meet for lunch at a restaurant that serves her favorite, Kheema Pao. At least that's what I scribbled down while watching the movie. But I couldn't find a recipe with that name. I found Kheema Pav which is Kheema (lamb curry) on Pav (a yeasty roll). Given that Jake is currently gluten-free, I kept researching and decided to make Kheema Aloo, lamb curry with potatoes. And I added green beans because that was one of the dishes in Saajan's first tiffin from Ila. In a large, flat-bottom pan, heat the oil and add the chopped onions, garlic, and orange bell peppers. Cook until the onions are beginning to caramelize. Stir in the ginger, cayenne, coriander, cumin, and garam masala. Add in the lamb and cook till completely browned. Pour in the tomato sauce and water. Bring to a boil. Stir in cubed potatoes, cover, turn the heat to a simmer and cook until the potatoes are softened, approximately 10 to 15 minutes. Stir in the green beans, cover, and cook for 2 to 3 minutes. You can cook them longer, if you wish, but we like our vegetables al dente. Check the consistency of the curry, if you prefer a more saucy curry then don't dry out all the water. If you like a more dry curry, cook for a little bit longer. Just before serving, stir in the lemon juice. Season to taste with salt and pepper. Garnish with fresh cilantro. I served this with tri-color quinoa, a spicy mango salad, and garlic naan. I'll be sharing a round-up of all the recipes from the Food'N'Flixers at the end of the month. I can't wait to see what they cook up based on The Lunchbox. I'm on Orphan-detail today for the Secret Recipe Club - for someone in Group D - and I am so excited about having been introduced to Nicola of Lemon and Cheese. What a lovely blog! One of the reasons I always volunteer to help out an SRC orphan is to meet new foodie bloggers. And Nicola is definitely one to follow. She's a London-based librarian and you can almost tell that from her recipe index. It's organized by ingredient and cross-referenced by categories, both broad and specific. She shares that she tends to "stick to simple cookery, with lovely fresh ingredients as well as a few helpful freezer items!" She's a prolific cook, so it was hard to decide. For instance, she has nearly twenty gratin recipes and thirty sausage recipes! I was immediately drawn to her Merguez, Egg, and Yoghurt as a hearty brunch or even dinner. Her Guatemalan Green Chicken Stew looked quick and delicious. I was eyeing her Hake Bobotie because we love bobotie, but have only ever had it with meat. And I really considered her 12-Hour Rabbit Bolognese. But, in the end, I decided to make her Lemony Potato, Broccoli, and Goat Cheese Salad. Since lemon and cheese are two of her favorite foods, as well as the name of her blog, I thought it was fitting. I did make a mistake in not letting the vegetables cool before stirring in the cheese. So, it melted into a creamy dressing. but it was delicious nonetheless! Thanks, Nicola, for the inspiration. Next time I'll let it cool and try to keep the cheese in cubes or shred. Boil the potatoes until just fork tender. Lift out with a slotted spoon, drain well, then place in a serving bowl with the oil, lemon zest and juice. Drop the beans and broccolini into the water and bring back to a boil. Cook until the turn a vibrant green and are still crisp. Drain. Stir the drained broccoli and beans into the potatoes Fold in the dill, salt, pepper, and goat cheese. Serve immediately. When a friend was hosting a blueberry potluck brunch - the theme is based on what our pregnant friend and her husband are calling their soon-to-be-born baby, Blueberry, since they aren't sharing his real name just yet - and I, naturally, applied it to my brunch dishes. I wanted to serve Salmon en Papillote and decided that pickled blueberries would pair nicely with that. Done. I've made pickled blueberries before. But I wanted to change it up as the onions were a little too piquant for my tastes. So, in this version, I softened the onions before putting them together with the blueberries. I served it, at the blueberry brunch on top of this...well, after this was cooked. Yum!